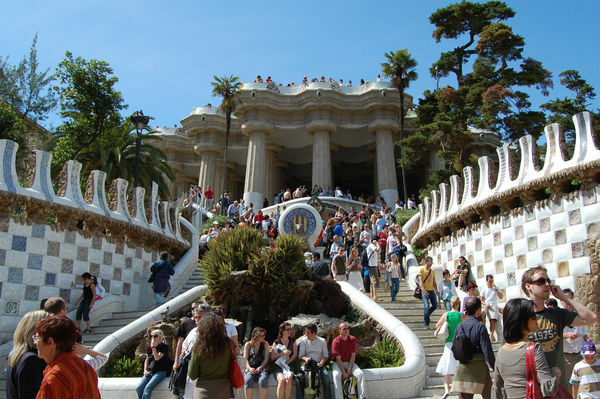 Few cities so easily enchant visitors with their beauty and flavor like Barcelona. 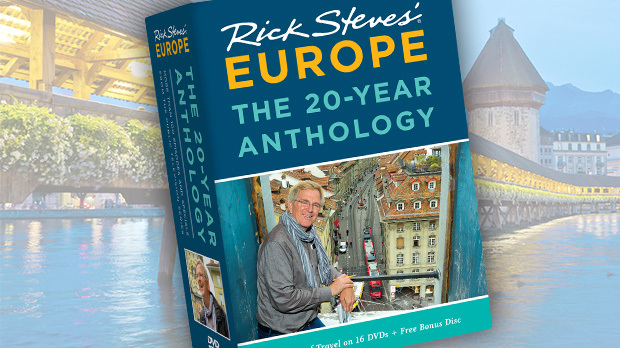 Life bubbles in its narrow, old-town alleys, grand boulevards, and elegant modern district. While Barcelona has an illustrious past — from Roman colony to 14th-century maritime power — it's enjoyable to throw out the history books and just drift through the city. A stroll down Barcelona's main pedestrian drag, the Ramblas, is a freefall into sensory overload. This grand boulevard takes you from rich (the elegant main square, Plaça de Catalunya) to rough (the port) in a one-mile, 30-minute walk. The Ramblas, which means "stream" in Arabic, is an endless current of people and action. 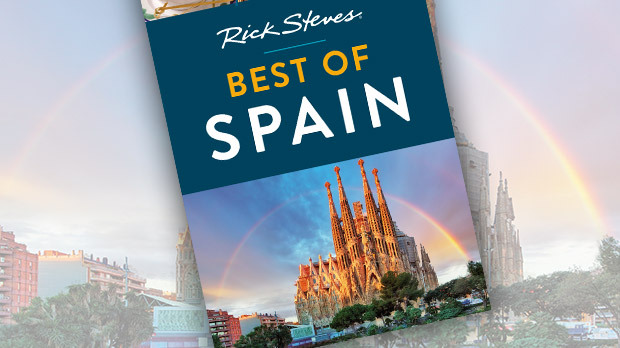 You'll raft the river of Barcelona life past a grand opera house, opulent cafés, retired prostitutes, artists, street mimes, an outdoor bird market, and pickpockets (wear a money belt). At the lively La Boqueria produce market, locals shop in the morning for the best and freshest selection of meat, fruit, and veggies. They say if you can't find it in the Boqueria…it's not worth eating. East of the Ramblas is Barcelona's Gothic quarter, the Barri Gòtic, which centers around the colossal cathedral. The narrow streets that surround the cathedral are a bustling world of shops, bars, and nightlife packed into narrow, winding lanes and undiscovered courtyards. Just above street level is a tangle of wrought-iron balconies whose bars barely contain their domestic jungles. A creative spirit is part of the ebb and flow of daily life in Barcelona. Modern artist Joan Miró lived in the Barri Gòtic. His designs are found all over the city, from murals to mobiles to the La Caixa bank logo. If you enjoy his childlike style, ride the funicular up to Parc de Montjuïc, and peek into the Fundació Joan Miró, a showcase for his art. The Barri Gòtic was also home to a teenaged Pablo Picasso. It was in Barcelona, in the 1890s, that Picasso grabbed hold of the artistic vision that rocketed him to Paris and fame. The Picasso Museum, in the Ribera district, is far and away the best collection of the artist's work in Spain. Seeing Picasso's youthful, realistic art, you can better appreciate the genius of his later, more abstract art. For a refreshing break from the dense old city, head north to the modern Eixample neighborhood, with its wide sidewalks, graceful shade trees, chic shops, and Art Nouveau frills. Barcelona was busting out of its medieval walls by the 1850s, and so a new town — called the Eixample ("expansion") — was laid out in a grid pattern. The original vision was an egalitarian one: Each 20-block-square district was to have its own hospital and large park, markets, schools, and daycare centers. 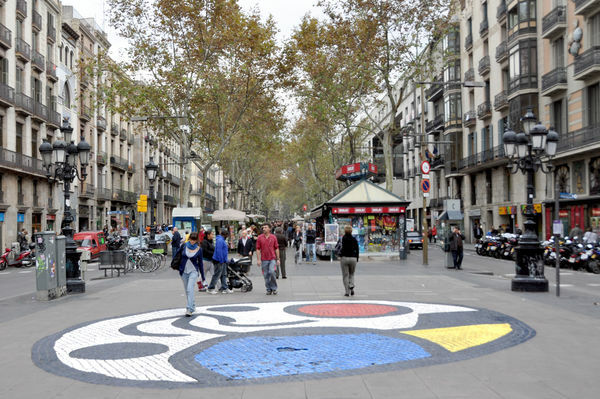 But over time the Eixample became a showcase for wealthy residents and their Catalan architects, who turned the flourishing Art Nouveau style into Modernisme, their own brand of decorative design. Buildings bloom with characteristic colorful, leafy, and flowing shapes in doorways, entrances, facades, and ceilings. Barcelona's most famous Modernista artist, Antoni Gaudí, created architectural fantasies that are a quirky quilt of galloping gables and organic curves. A quintessential example of Modernisme, La Pedrera (a.k.a. Casa Milà) has walls of wavy stone and a fanciful, undulating rooftop, where 30 chimneys play volleyball with the clouds. At Casa Batlló, a green-blue ceramic-speckled facade, tibia-esque pillars, and shell-like balconies are inspired by nature, while the humpback roofline suggests a cresting dragon's back. But Gaudí's best-known and most persistent work is the eternally unfinished Sagrada Família, with its wildly creative, unmistakably organic arches and spires. The Nativity Facade, the only part of the church essentially completed in Gaudí's lifetime, shows the architect's original vision. Mixing Christian symbolism, images from nature, and the organic flair of Modernisme, it's an impressive example of his unmistakable style. Climb up between the spires for a gargoyle's-eye perspective of a living, growing, bigger-than-life building. Local craftsmen often finish up their careers by putting in a couple of years working on the project. The church is supposed to be completed in 2026, which marks the 100th anniversary of Gaudí's death. It could happen — after three decades of visits, I've seen considerable progress. Your admission helps pay for the ongoing construction. Gaudí fans also enjoy the artist's magic in the colorful, freewheeling Park Güell, a 30-acre hilltop garden once intended to be a 60-residence housing project, a kind of gated community. Carpeted with fanciful mosaics and dotted with sculptures (including a giant tiled lizard), this park is a great place to cap the day. From art to food to markets, Barcelona specializes in lively — and that's why it's such a hit with travelers.